I’m officially declaring it South Lake Avenue Appreciation Week on Gastronomy! While not nearly as hip a ‘hood as Old Pasadena, South Lake can hold its own, especially when it comes to casual dining. Though the street is mostly lined with local and national chains like Lemonade, Panda Express, and Souplantation, there are a handful of one-off concepts like PokeMix, too—there’s a time and place for both kinds of establishments. 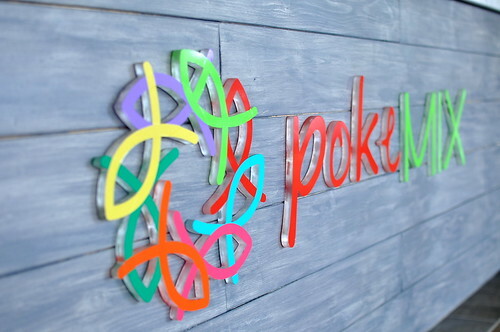 Pokē is currently having a moment in L.A., with half a dozen shops opening in the past few months. 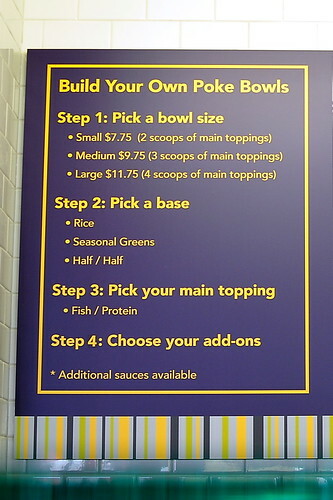 PokeMix, which offers a “Build Your Own Poke Bowl” experience, comes from the folks behind Flour + Tea. Ordering here is a multi-step process. First, diners select a size: small (2 scoops of main toppings), medium (3 scoops of main toppings), or large (4 scoops of main toppings). Second, a “base” of either rice, greens, or half and half needs be chosen. Third comes the seafood— salmon, spicy tuna, albacore, shrimp, scallops, and krab. And finally, a plethora of garnishes and sauces to finish. The Astronomer and I shared two “bowls” for lunch—a small and a medium. 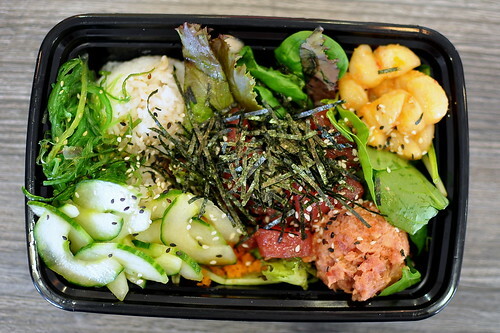 We customized our medium ($9.75) with half greens and half rice, scallops, spicy tuna, and albacore. To garnish, seaweed salad, cucumbers, sesame seeds, nori, Hawaiian sea salt, and tobiko. While this pokē was quite different from what I experienced in Hawaii, the flavors and ingredients came together quite tastily. The strongest protein on the plate was the albacore. 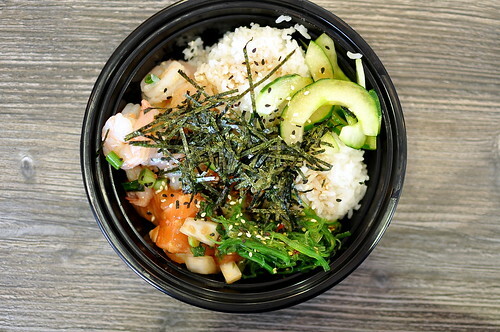 For our small bowl ($7.75), we went with all rice, salmon, and shrimp. Both proteins were excellent, besting the ones in the medium-sized bowl. While I appreciated PokeMix’s unique take on pokē, I wished the portions of fish had been more generous. I’m returning to Honolulu next month and cannot wait to reunite with Foodland’s heaping bowls. Mmm, abundance. Private: Happy New Year, Y’all! Couldn’t agree more on the fish portion sizes. When I tried it, think I got the 4-fish combination…and it still wasn’t even that much fish. There is a restaurant called PokiNometry located 184 South Harbor Blvd, Anaheim, CA 92805 owned and operated by Julian Fukue. He is trying to rewrite the Hawaiian language, definitions for Hawaiian words and Hawaiian foods. He is misspelling “poke” by calling it “poki” and trying to define the definition of “poke” to “poki”. In the Hawaiian language the definition of “poki” is “dog”. We in Hawaii are not happy with Julian Fukue and anytime someone comes from California to Hawaii asking for “poki” we will inform them we don’t serve your beloved Lassie (dog) in Hawaii. I have heard good things about PokiNometry, Ken! A shame they’re butchering the Hawaiian language though. 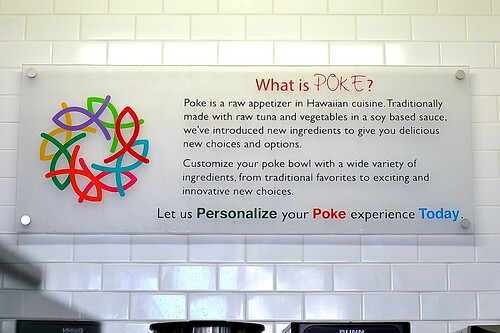 Darin – I hope the new poke spots popping up around town are more generous with their fishes. Where’s the aloha spirit in skimping?